I hope you all had a great week! I spent mine getting things ready for some events I am hosting and just hanging with my besties. I am so ready to share the final hotel from my stay in Houston with you guys! So lets just jump into it! For the last part of my week in Houston I was hosted by the amazing Hotel Alessandra, and let me tell you guys it is literally one of my favourite hotels now! First off lets start with my room because it was gorgeous! Everything in there was totally chic and modern. I loved the vibe SO much, it was one of the most aesthetic rooms ever. Another cool feature was the tablet that let you order room service and read about all the amenities that the hotel had to offer! Hotel Alessandra has an awesome gym that you have to check out if you stay with them. They have the newest, nicest equipment and I loved the refreshment area that they had stocked with cold water and towels. They even offered bottle Fiji water for you to take with you while you're actually working out which I loved! Of course they have an AMAZING pool because how could they not!? There are tons of spots where you can just lay out and work on your tan or there are even loungers in the shallow end that you can relax in if you don't feel like diving right in. If you are in Houston I HIGHLY recommend staying at Hotel Alessandra. The location of the hotel is absolutely stellar. You are right downtown H-Town and are also only blocks away from Minute Maid Park, the Toyota Centre, and the House of Blues. You couldn't ask for a better location! I hope you guys have a great weekend! I am about to spill the tea on my new favourite tea spot in Houston! Who's ready!? 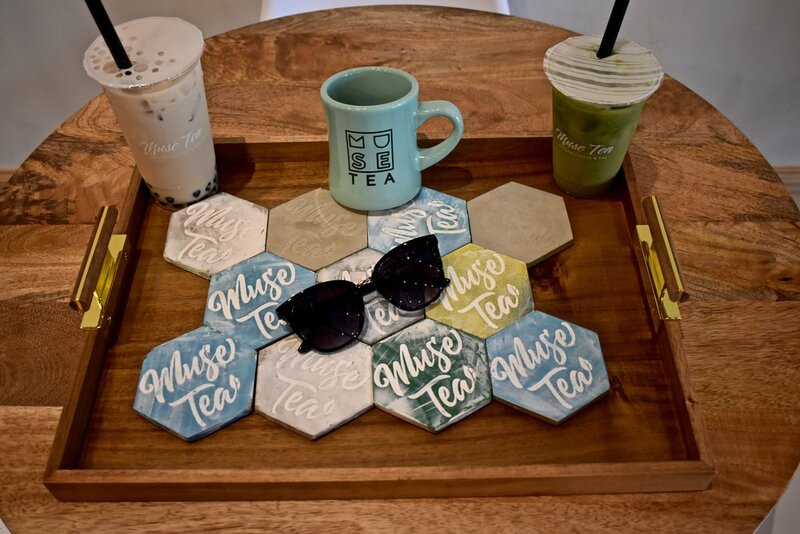 Muse Tea is nestled in the cutest little neighbourhood just outside of Houston and their teas are AMAZE! They have everything from Bubble/Boba Tea to Iced Tea Slushies. We are talking about ALL THE TEA YOU GUYS!!!! If you want to see more of their menu definitely check out their Instagram and Facebook I could only try so many drinks but they have TONS more! That layered drink is their Galaxy Tea and also one of the prettiest drinks I have EVER seen! If you have any questions or comments leave them down below or find me on my socials and slide into my DMs! I hope you all are making it through this Hump Day!